What does a successful project look like the first few years after construction? Look for pools, riffles, vegetation, and little critters. So, you’ve completed construction of a stream restoration project. Maybe you fixed a significant erosion problem, restored an agricultural ditch, removed a dam, or built a new bridge. 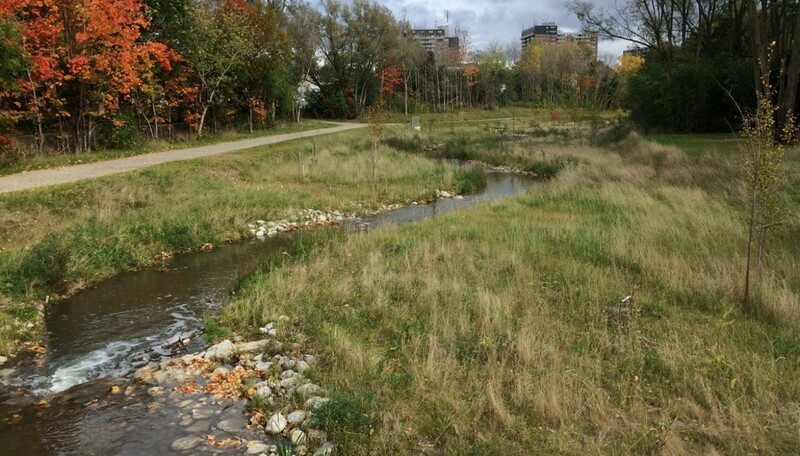 Whatever the reason for your project, you want your rehabilitated creek to be stable, have a working floodplain, have healthy vegetation on the banks, and healthy fish communities in the creek. When you look at the watercourse, how do you know if the restoration is working? What does a successful project look like in the first few years after construction? When you’re walking along the creek bank, take a look down. Pools and riffles should be where they belong. Examine the stability of the creek and the vegetation on the banks, and see what creatures are calling the site home. Of course, a post-construction monitoring program will tell you in detail how well your project is working. But instead of waiting for those results to come in, you can finish reading this blog post, and then take a quick walk through your site to find out for yourself. 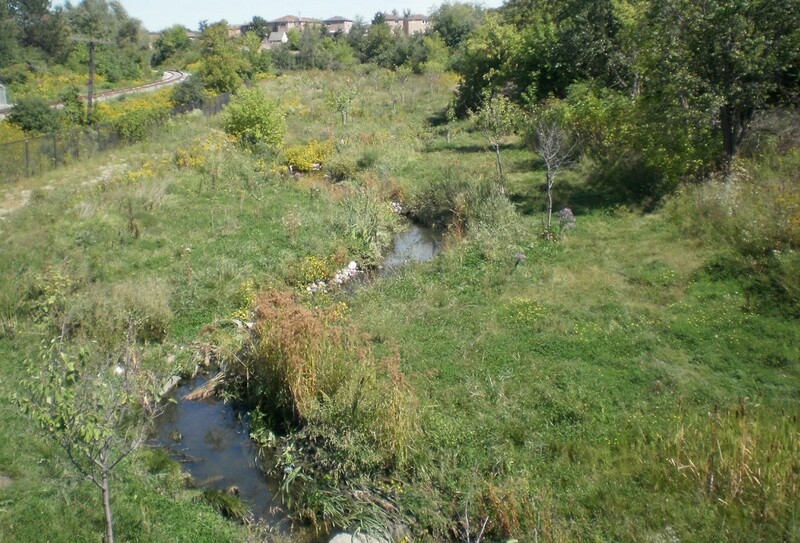 Here are seven ways to tell if your stream restoration project has succeeded. As you stroll along the creek bank, take note of the slope of the water surface. The flat water (pool) and steep water (riffle) features of the stream should be roughly where they were constructed—with pools in the bends, and riffles in the straight sections. The pools shouldn’t be filled in with riffle substrate, because the cobble and gravel in the riffle substrate belongs on the riffles. You shouldn’t see large areas of erosion or scour on the banks. Don’t worry if you spot small sections of erosion or scour—which is when swift-flowing water removes soil or rock—since they may not be indicators of instability. The stream may naturally heal itself if given a little time. Looking at streams in the early spring, before the banks get covered in green, can be a bit scary. But even if you notice a bit of scour early in the year, in a month it could be nicely stabilized by a new patch of grassy green vegetation. An example of sediment deposition on a point bar. The right places to see sediment deposition are in the floodplain and on the point bars on the inside of the bends. These areas are the natural deposition areas in meandering watercourses. Seeing sediment depositing on the floodplain tells me that the flows have spilled out of the stream banks where the water was slowed down, and the erosion potential of the flows in the channel was reduced. Sediment deposition on the point bars shows me that the pool-forming process is at work scouring out the pools to keep them nice and deep, and dropping sediment out on the point bar. Head cuts, or abrupt vertical drops, are evidence of vertical instability on the channel bed (Niagara Falls is one example). They form when bed material is eroded away and not replaced, causing the channel bed to lower, and leaving a step feature in the channel. These features are usually mobile features that travel upstream through a site until the whole channel bed is lowered, and the channel slope is reduced to a stable slope. When I see a head cut starting, I always look for the reason it’s happening and a way to stop it immediately. Lower channel beds mean less frequent floodplain access, and steps are possible barriers to fish passage. It also means that your channel is losing sediment and substrate. That extra material needs to go somewhere, and it may end up harming a system downstream. This is what early riparian vegetation growth looks like along a restored stream. Riparian vegetation plays several important roles in a channel ecosystem. 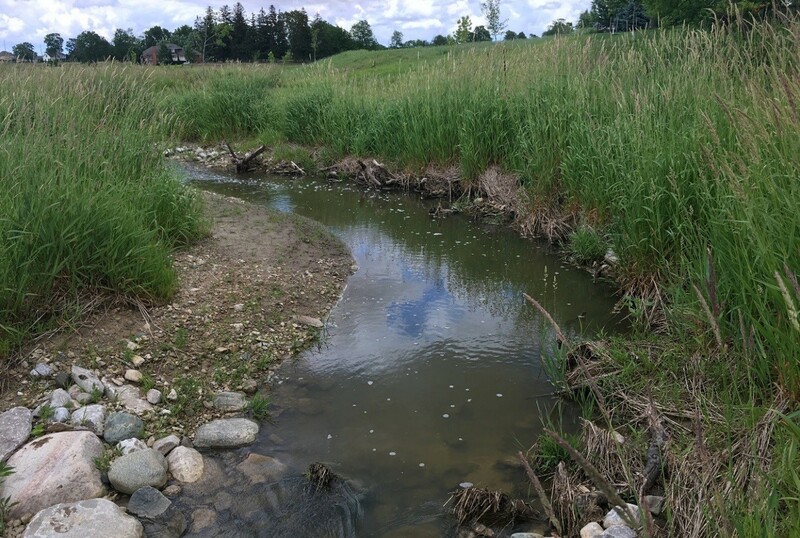 A healthy vegetation community on the channel banks and floodplain—in the riparian zone—is key to a successful channel project. Riparian vegetation plays several important roles in a channel ecosystem. It holds the banks to the channel together with roots. It provides a habitat for many birds, insects, amphibians, and other critters. It shades the stream, keeping the water temperatures cool. The leaves and other bits of plants that fall into the creek provide carbon and food for aquatic organisms. This brings us to the next point. Benthic invertebrates are the little water bugs near the bottom of the food chain in a creek system. Benthic invertebrates are the little water bugs near the bottom of the food chain in a creek system. These little guys live on or under the creek substrate and eat up leaf litter or eat one another. 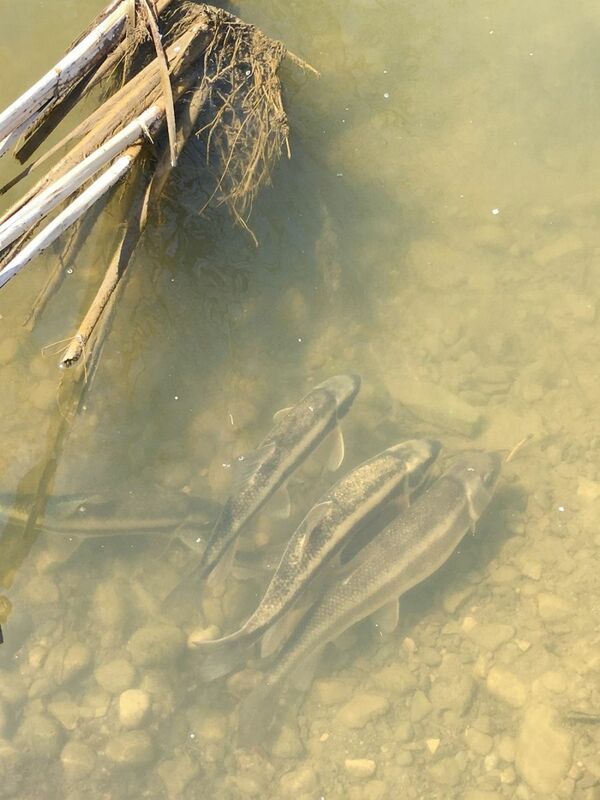 They are important to the nutrient cycle in a waterbody and are also dinner for a variety of fish species. Having benthic invertebrates in a creek tells you that your aquatic ecosystem is functioning. 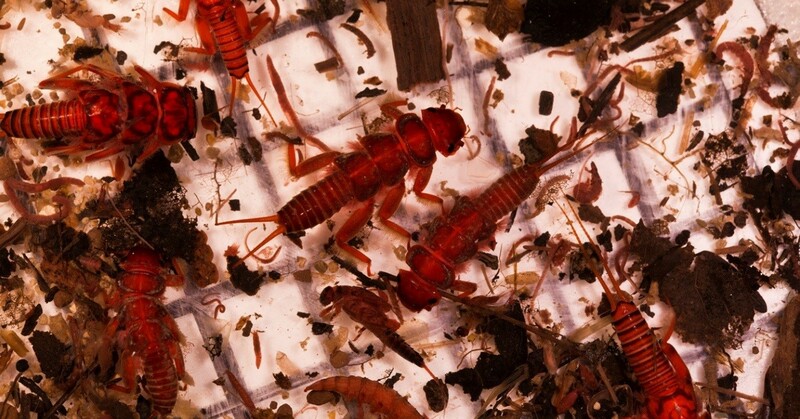 Certain types of benthic invertebrates are also indicators of good water quality. There is nothing more satisfying than looking over a project after it’s built and seeing fish spawning in your stream site. To me, this is an indication that something is going right in the stream system. Some combination of flow depth, velocity, substrate, and oxygen concentration has worked well, so that even a casual observer can see that this site is habitat. Having fish in a creek is one of the best ways to demonstrate to the community that your project was worth it. The noise and dust of construction are over, and a whole new ecosystem is establishing right in your neighborhood. It’s the best part of my job. So, the next time you’re looking over a stream project and wondering if it’s “working” or not, think of these seven points. Examine the stability of the creek and the vegetation on the banks, and see what creatures are calling the site home. Hopefully, your observations will show you a green and vibrant stream habitat, full of life. Heather Amirault is a water resources engineer at Stantec with a focus on stream restoration and geomorphic assessment. 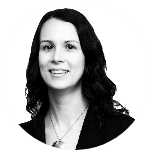 She works with clients and regulators to develop design solutions that are functional, constructible, and cost-effective to build.